Create a project using the colors: Use red, white, green, and black. You have TWO WEEKS to play along - Deadline to enter is Friday, November 23, 2018 at Midnight CST. The winners will be announced on the NND blog the following Monday. 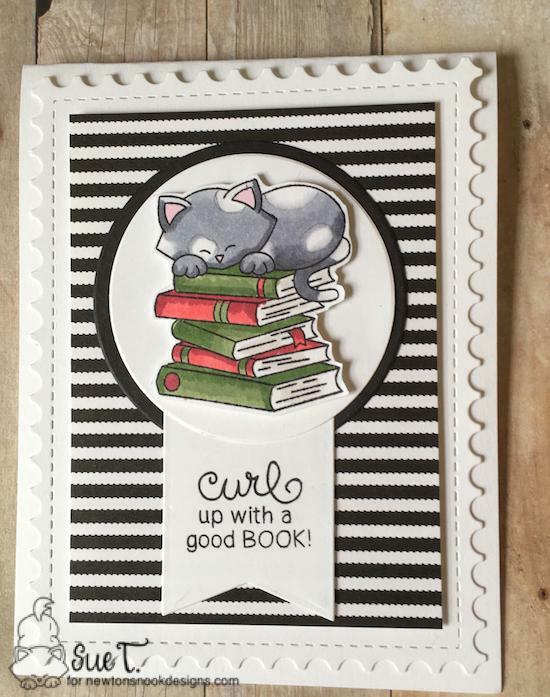 Sue T. gives us this darling card that features the very studious kitty from the Newton's Book Club stamp set. 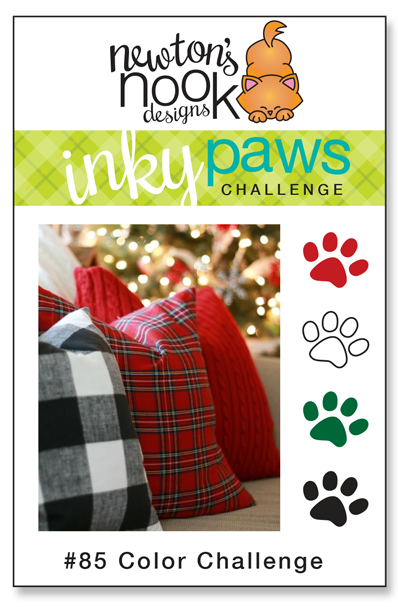 Sue uses the red and green of the challenge for those textbooks and brings in the black and white with her striped pattern paper. She uses the Framework dies to create the white backdrop. So fun! 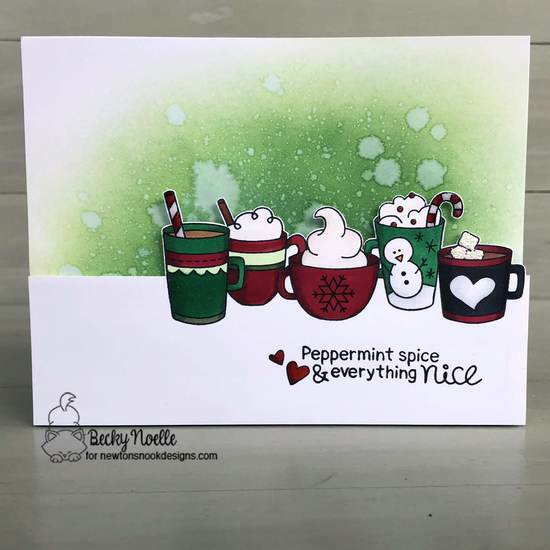 Becky Noelle is serving up some holiday cheer with her fabulous green distressed background paired with all those mugs from the Cup of Cocoa stamp set. She uses the challenge colors to shade the mugs and adds the sentiment with those fun hearts from the Frozen Friends stamp set! So festive! Debbie Owens is also serving up some hot chocolate using the Cup of Cocoa stamp set. 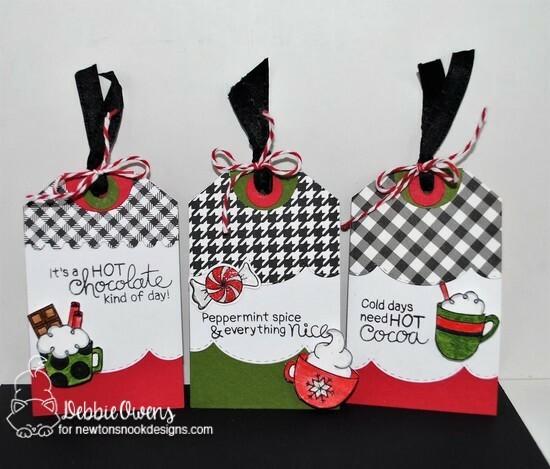 Instead of a card though, she makes a trio of tags using the Fancy Edges Tag die set. She adds black and white pattern paper of various designs and black ribbon and red & white twine. Diane Morales designs this delightful tag. 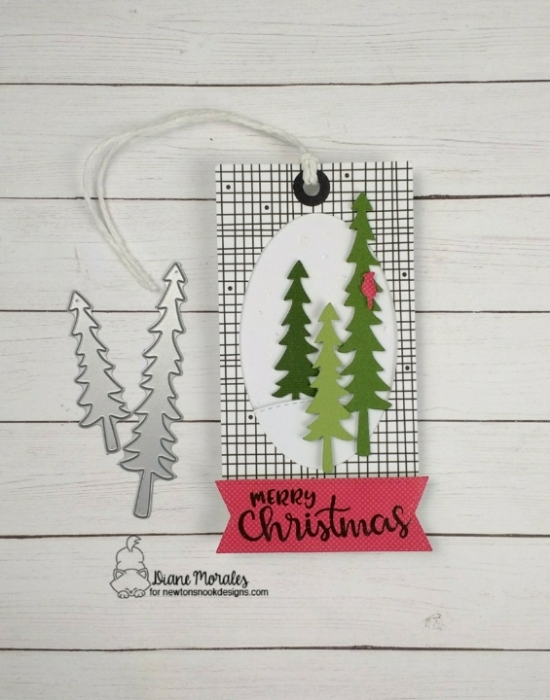 She uses the Forest Scene Builder die set to create the evergreen trees She layers them on the oval with a hill of snow. She uses a black and white grid-like paper for her tag. She stamps the Merry Christmas sentiment from the Sentiments of the Season stamp set on a red banner which goes wonderfully with the red bird on the tree. Emily Lauritzen brings us this elegant card by creating a background using the Holiday Foliage stencil. She frames this on black using the Frames & Flags die set. She embosses the sentiment from the Ornamental Wishes stamp set on red paper and mats it on a black frame from the Framework die set. She adds holly leaves using the Pines & Holly die set. great challenge and so wonderful inspirations from all! Thanks for all the fantastic inspiration!